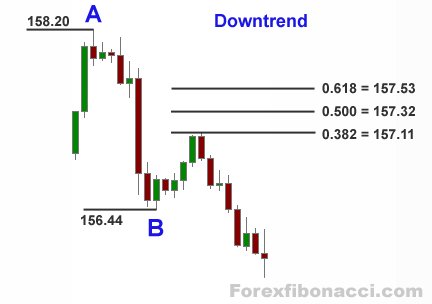 Three most used Fibonacci retracement levels are 0.382 or 38.2%, 0.500 (50%) and 0.618 (61.8%). 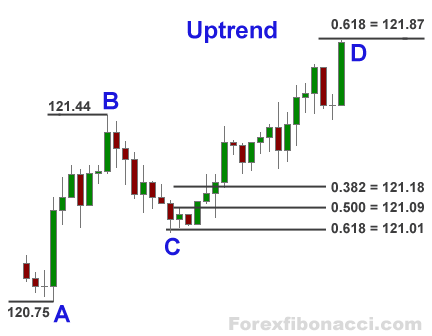 Three most used Fibonacci extension levels are 0.618, 1.000 and 1.618. Also 1.382 extension can be applied as well. highest swing — point B — 121.44. B — A = ? Our next example is downtrend. Highest swing — point A — is 158.20; lowest swing — point B — is 156.44. A — B = ? Because of the downtrend we need to add to the lowest point B to find retracement. To help calculate Fibonacci levels we have also made a free tool for Forex traders — Free Fibonacci Calculator — available for downloading.